Apple has restarted production of last year's iPhone X, according to one of the nation's most prominent financial publications, which claims the company is doing so out of international demand and a questionable obligation to fill a sales quota with OLED supplier and smartphone rival Samsung. The iPhone X was removed from sale in Apple Stores around the world following the introduction of the iPhone XS and iPhone XS Max, with an expectation that consumers would want to acquire the more recent product launches. For models that are effectively entirely replaced by a newer version, production for older variants typically reduce down to match the lower levels of demand, or cease entirely. According to sources of the Wall Street Journal, Apple has resumed production of the iPhone X. 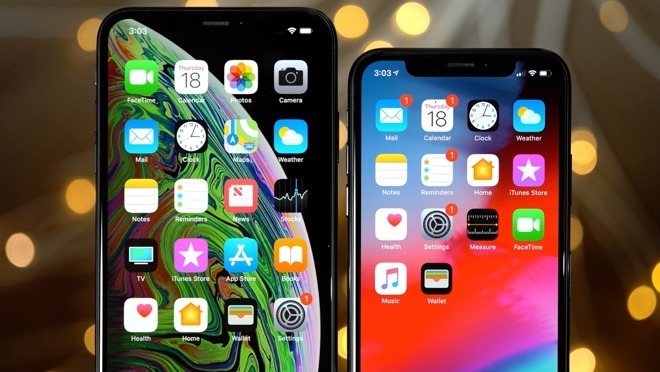 While it is unclear exactly why production has recommenced, a person familiar with Apple's sales and production tactics advised the report that Apple does produce legacy models for select markets where there is enough demand. The production is a way to fuel sales and increase margins, the sources advise, with components for the iPhones typically costing less to produce or acquire, and with manufacturing equipment depreciated in value to make production viable again. An example of this is Apple's production with Wistron in India, where the manufacturing partner is producing the iPhone 6s in the country alongside the iPhone SE. In June, it was estimated the iPhone 6 series accounts for a third of iPhone sales in India. The report also suggests the resumption of iPhone X production is in part caused by Apple's contract with Samsung SDI for the production of OLED panels used in the iPhone X, iPhone XS, and iPhone XS Max. Apple is supposedly required by contract to buy a minimum amount of OLED panels from Samsung, and due to alleged cuts in the iPhone XS and iPhone XS Max production, Apple has turned to the iPhone X to use up the remainder of the supply. This claim is dubious for a few reasons, with a key element being the improbability that Apple would not protect itself from such minimum orders to such a level it would require the manufacturing of older hardware. Considering the price of the iPhone XS at launch mirrored the cost of the iPhone X, as well as the considerable similarity of the two models, it seems even more unlikely that consumers would elect for an iPhone X over an iPhone XS or iPhone XR. The talk of new iPhone X production is part of a report claiming Apple is cutting the price of the iPhone XR in Japan to boost its sales, with carriers in the country apparently set to start reducing the cost of the handsets from early next week. Carrier officials believe it is rare for Apple to perform a price cut on a recently-released device in the market, though it has done so before. "A price cut within a month of release is rare not just for Apple but for smartphone makers in general," one senior official advised. Japanese consumers are said to claim the iPhone XR's price is too high for the sacrifices it makes in display quality, cameras, and slower transmission speed. The iPhone 8, a 2017 release, is reportedly still popular in the country for those looking for an affordable iPhone, as it is both cheaper than the iPhone XR and was available at the time of the iPhone XS and iPhone XS Max launches.